﻿ Ancelotti: "Cristiano Ronaldo is highly motivated to play against Schalke 04"
25.02.2014 » Ancelotti: "Ronaldo is highly motivated to play against Schalke 04"
February has been an unusually quiet month for Ronaldo and that's mainly due to that red card he got shown last February 2, against Athletic Bilbao, at the new San Mamés stadium. Real Madrid faces Schalke 04 in Gelsenkirchen this Wednesday night and judging by Ancelotti and Xabi Alonso words, Cristiano Ronaldo is highly motivated and eager to leave a good impression. The UEFA Champions League has already resumed last week, but Real Madrid will only show their credentials this Wednesday night, when they step on to the Veltins-Arena to face Schalke 04. After a succesful campaign in Group B where they've finished first without losing any game at all (5 wins and 1 loss), the Merengues prepare their visit to Germany during one of the best moments they are going through this season. Not only they will see Cristiano Ronaldo returning to the team after having served a 3-game league ban in Spain, but Ancelotti's men have also been playing great football week after week and are now finally leading La Liga, 3 points clear	of both Barcelona and Atletico Madrid. 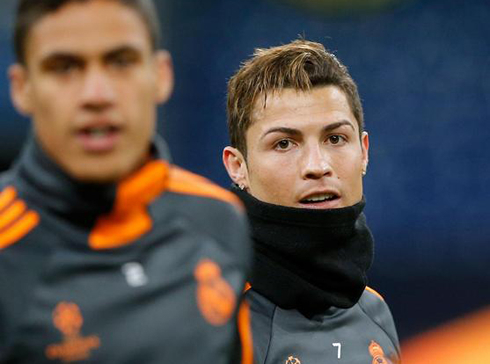 Tomorrow night, it will be all about Schalke 04 vs Real Madrid though and as surprising as it may sound, there's probably no man more anxious about that game than Cristiano Ronaldo himself. Schalke 04 and Real Madrid won't be the only teams taking stage this Wednesday night, as we'll also have a Galatasaray vs Chelsea clash being played just a few thousands of miles away, at the Turk Telekom Arena. These will be the last 4 teams playing their first leg ties in this UEFA Champions League last-16 round, and so far, everyone who was regarded as favorite on paper already seems to have gotten the better of their opponents. All except probably for Manchester United, who got surprisingly defeated by Olympiakos this Tuesday night, by 2-0. By the time we ended the group stage fixtures in last December, Cristiano Ronaldo had been the top goalscorer of the competition, after having reached an impressive mark of 9 goals in only 5 games. It was actually enough to set a new record in the Champions League (accounting only for the group stages) and with Real Madrid presenting themselves in such a good form at this point of the season, there's no reason to believe that the Merengues can't go through all the way until the final, set to be played in Lisbon, on May 24. However and in order to accomplish their first final in Europe since 2002, Real Madrid needs to get past Schalke 04 in a 2-leg tie, a side who is currently sitting in 4th place in the Bundesliga. The Germans come into this game with a recent record of 1 draw and 4 wins and just like many other teams that aren't used to play against Real Madrid on a regular basis, they'll probably look to this match as the most important one of the season. That's precisely the psychological factor that the Merengues need to be careful about, since quality-wise surely no one doubts that Real Madrid is vastly superior to Schalke 04. With that in mind, Carlo Ancelotti is definitely a happy man for finally having the opportunity to play with Cristiano Ronaldo on his starting line-up tomorrow night. The Portuguese forward has gone through a rough patch in the last weeks, being forced to watch his teammates playing in the league from the stands and waiting patiently for this day to come. It's true that he still had a couple matches against Atletico Madrid for the Copa del Rey during February, but those were played right between the league games on which he was suspended and therefore, never really allowed him to pick his rhythm. With the suspension finally over, that won't be the case this Wedneday night and according to Carlo Ancelotti and Xabi Alonso words, Ronaldo is hungry to leave his mark and make a strong statement! Ancelotti: "Cristiano Ronaldo is especially motivated for this game against Schalke 04, because he wasn't happy at all in the past weeks for not being allowed to play. However, he has taken this opportunity to prepare himself, to rest and he has definitely worked very well. Both his psychological and physical condition are great these days", started by remarking the former Chelsea manager, before issuing a short comment on a comparison between Huntelaar and CR7. Carlo Ancelotti: "It's not going to be a head-to-head rivalry between Huntelaar and Cristiano Ronaldo, but rather a Schalke 04 vs Real Madrid match. Don't get me wrong though, Huntelaar is a great player and very dangerous in all sort of attacking plays his team creates. However, I'm sure the collective will be far more important than the individual aspect", commented the Italian coach. 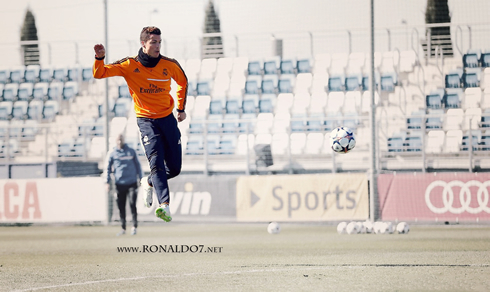 Who also seems to agree that Ronaldo is particularly motivated for this game against Schalke 04 is Xabi Alonso. The former Liverpool midfielder has spoken a few words about his teammate and believes that the unfairness of his 3-game suspension in La Liga has made him more strong and determined to help the team in what we have left in the season. Xabi Alonso: "He's the same person he has always been, but it's true that he felt frustrated with everything that happened in Bilbao and with the following 3-game ban he had to serve. It wasn't a fair situation and even less to be told to wait until a couple of hours before the kickoff against Elche, just to confirm him he still had to sit out from that game. However, that's all part of the past now and we're all highly focused for this Wednesday's match against Schalke 04", stated the 32-year old midfielder. 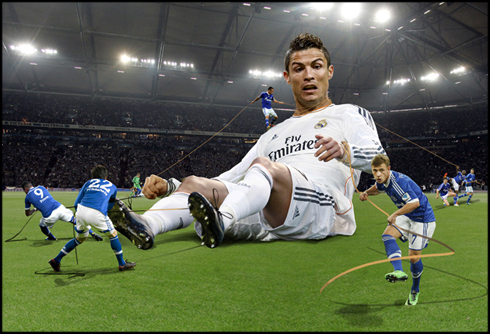 Cristiano Ronaldo next game for Real Madrid will be against Schalke 04, for the UEFA Champions League last-16 round first leg, on February 26 of 2014. You can watch Juventus live stream, Schalke 04 vs Real Madrid live, Barcelona vs Almeria, Galatasaray vs Chelsea and Tottenham vs Dnipro, all matches provided from our sports live section.